The Charlie is absolutely breath-taking. Its constructed of faux leather (PVC-free) and features their custom hardware in an antique brass finish. It smells just as great as it looks and no one would ever guess that this gorgeous and chic bag would ever have the word 'diaper' in its description. The Charlie is only for those who dare to be noticed. 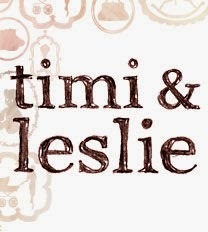 Timi & Leslie never falls short with any of their bags. 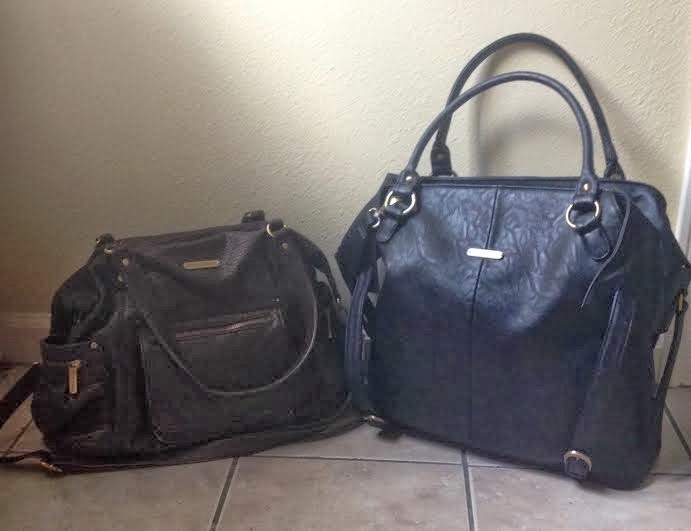 Not only do you get a great, durable bag, you also get a whole slew of matching accessories! Each of their convertible collection bags come standard with a very generous-size changing pad, a wet bag, stroller clips, cross body strap, a matching clutch that doubles as your wallet or a purse, and even an insulated bottle tote. Trust me, you'll use each and every one of these too! I adore the changing pad because its the same size as others I've seen when folded, but much, much bigger when laid out. Its super easy to clean or wipe down with its water-resistant lining, and even has a front mesh pocket where you can store your diapers, wipes, and creams for those quick changes where you don't have time to fish everything out of your bag. Hubs actually dislikes me using the matching clutch because let's face it, diaper bags are perfect for sneaking in candy and drinks into a movie theater. 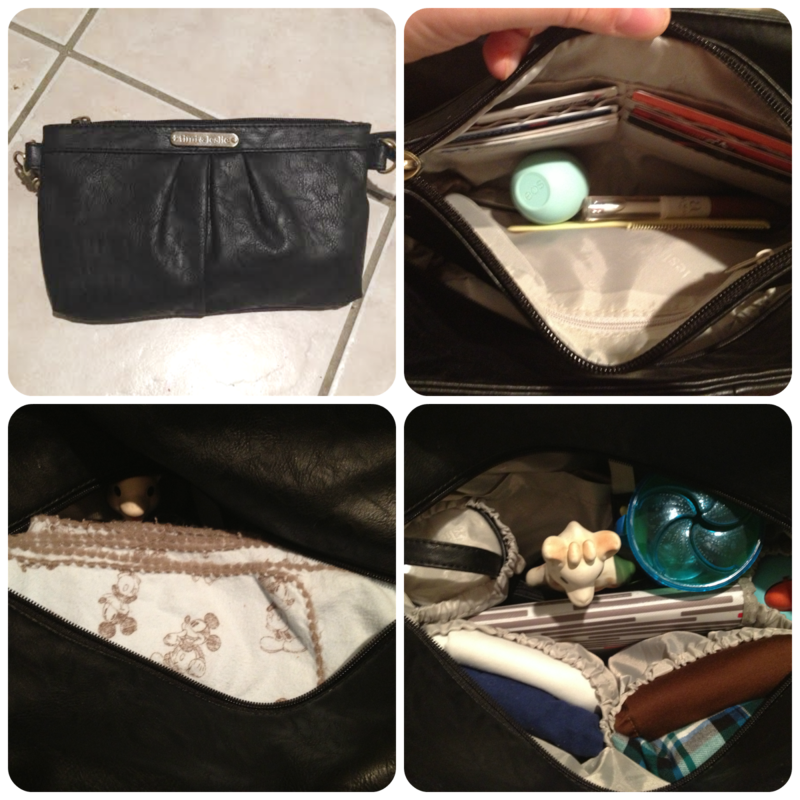 I personally love it and use it daily as both my wallet and my purse! It can hold more than it looks (we fit three of those box candies from Walgreens in it for a date night movie last week!) and is perfect for when you need to make a quick run into a store and don't want to lug everything with you. Charlie also comes with its own stroller straps so you won't have to buy those later! I like that it actually coordinates with the specific bag color you choose and it keeps everything up high (away from your feet and wheels) making both the bag contents and your basket easily accessible. The insulated bottle cooler actually comes with the bag as well and fits perfectly in the inner side pockets. We actually carried our breastpump bottle cooler around before, but the insulated bottle cooler keeps his bottles just as cold and takes up sooo much less space. 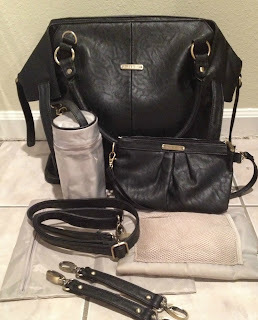 My favorite included accessory is the cross body, detachable and adjustable strap. I remember seeing these with a lot of bags when I was younger and it wasn't until I started college that I realized how amazing these are. Using them as a mom has just increased my appreciation tenfold! Whether babywearing, shopping, running errands, or just holding little man on my hip, I never have to worry about carrying the diaper bag. 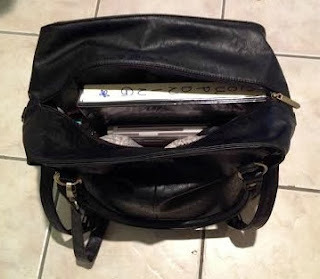 I just sling the cross body over my shoulder and hip, tuck dear old Charlie behind me and BAM! Both arms are completely free to do whatever I need them to do. If you have no idea what I'm talking about, you're truly missing out! So, its time for us to be honest. 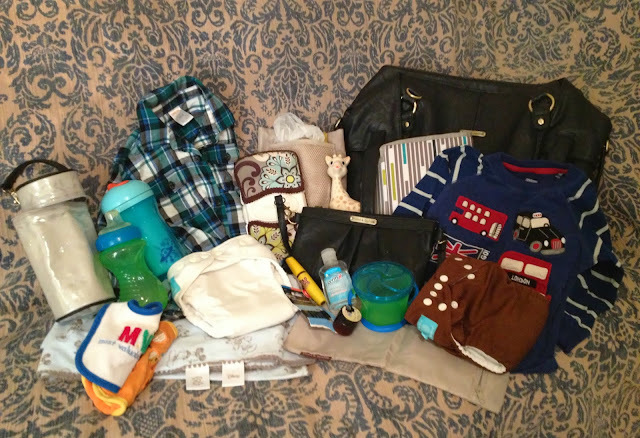 What's the weirdest thing you've found in your diaper bag this week? I've told you all about my mushed (and old. barf!) string cheese and spilled milk incident in our beloved Abby. Buddy Doo has already marked our Charlie with mandarin oranges and some cheese crackers (prechewed and soggy of course). You never find them when it first happens either. No, you find them hours, a day, even a week later. I have seen some disgusting diaper bags in my lifetime and its something many see as an inevitable certainty. After all, you do use it from birth through toddlerhood. Sure, the Charlie is a little pricey at $159.99, but its durability alone makes it worth every penny. The interior is water resistant so its actually really easy to clean. Phenomenally easy. You don't just get all the crumbs out, you can get all the stains and smell out too and keep it looking brand new with regular cleanings. The light colored lining is also designed for you to be able to spot everything in your bag without the 'shadows' darker interiors can create. There's two smaller exterior pockets that are great as either pacifier holders or as 'mommy pockets' and six interior pockets for organizing everything. I personally attach my keys to the same brass hardware you attach the stroller and cross body straps too, but there's also an interior key fob if you prefer. The Charlie is huge with dimensions of 15.5"H x 17"W x 4.75" D x 7" HD. (I apologize for the crappy picture, we have hardly any free space in our house right now because of the holidays) The Charlie is much bigger than the Abby. We love the Abby and it used to be my primary bag (trust me, it still gets a lot of use -wink-).....until I discovered a great alternative use for the Charlie: diaper bag AND a budgeting/grocery list/couponing bag! 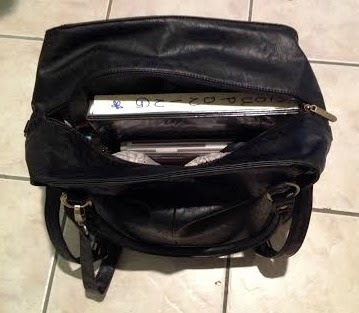 Yes, that's an entire binder that fits perfectly in the Charlie without obstructing any of my normal bag necessities. Words can't express my excitement at discovering this. I'm huge with organizational printables from Pinterest, but I almost always forget the grocery shopping ones at home because I've never had space in my diaper bags before. So, just how much can you fit in the Charlie anyway? Check out what's in my diaper bag and clutch on a normal outing! Yes, all of that fits comfortably in the Charlie without distorting it or having it lose its shape! Amazing. 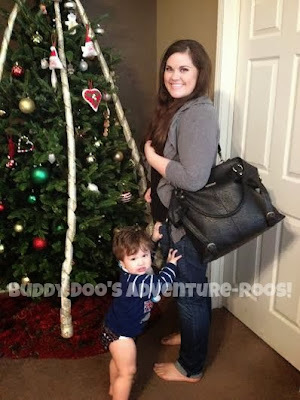 If you're looking for a toddler bag or a baby diaper bag, I recommend the Abby. 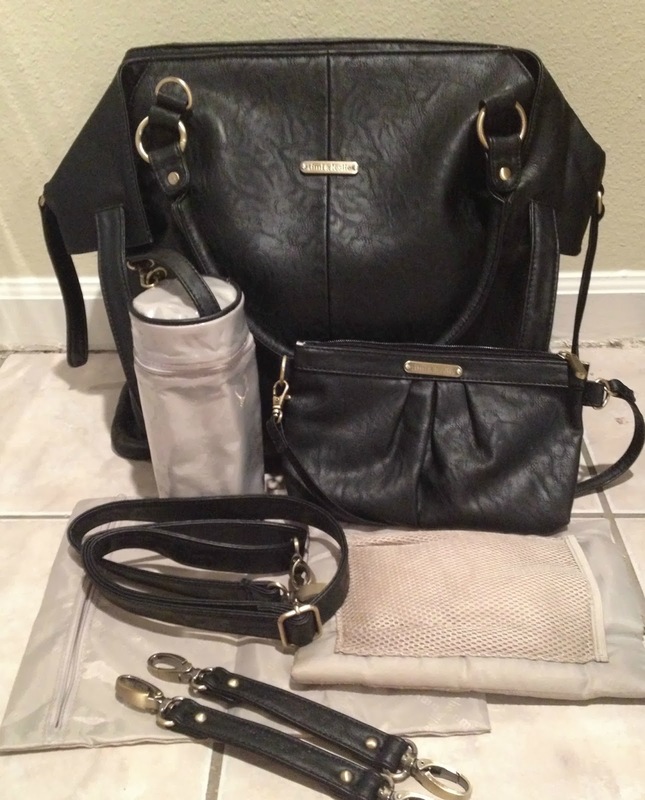 If you're looking for a baby and toddler, two babies/two toddlers, a diaper bag that can double as a carry-on while traveling or road-tripping this holiday season, or a diaper bag that carries all of your child's/your essentials and a binder to run your household, treat yourself to the Charlie. It'll blow your mind. 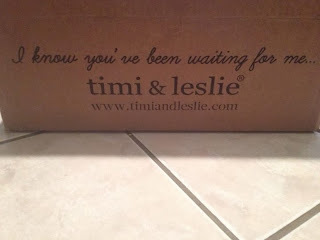 Either way, make sure its a Timi & Leslie and you'll never regret your decision! 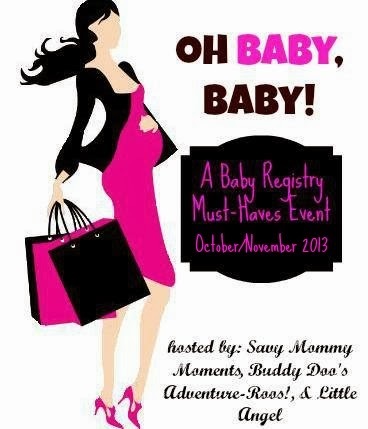 Be sure to join their mailing list to stay in-touch with future promotions, sales, and new fabulous styles and colors! Subscribe by submitting your email at the space provided towards the bottom left of the home page here. 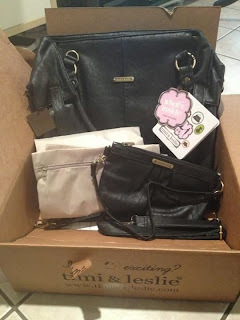 WIN IT: One lucky reader will win the Timi & Leslie Charlie bag in Black (like the one featured in this review)! Talk about a very merry holiday :) Must be 18 years of age or older and a legal citizen of the US. One entrant per household. Ends January 10, 2014 at 11:59PM CST. Good luck! Yes!!! I like your this bag. I prefer bags those have big space for stuffs. It will more better if it have multiple zipper. In the multiple zipper it is easy to get your stuff without wasting time in search them out.